“Someone told me a quote about ‘being comfortable being uncomfortable’ and I think that was the best little nugget of advice I got” says Luke Newberry, about coping with the insecurity of an actor’s life. Though he went straight from drama school to filming Quartet, directed by Dustin Hoffman, then had a real introduction to fame as the “partially deceased” Kieren in BBC Three’s acclaimed zombie series In The Flesh (which earned him a BAFTA nomination and worldwide fans), Luke is still well-acquainted with the ups and downs of the industry. Now starring in the 1970s-set indie film Dusty & Me, he is charming, thoughtful and forthcoming when I speak to him. Not even the slight delay on the call, which I’d worried would make us sound like a 1980s transatlantic interview on Newsnight, gets in the way. We discussed (rather loudly on my part, it appears) his role as teenager Derek “Dusty” Springfield. 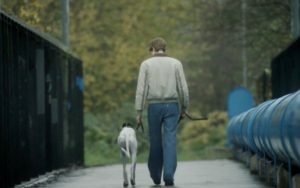 A clever but diffident 18 year old, Dusty’s spent years at public school on a scholarship – but is now returning to his working class home in Yorkshire to await his Oxbridge results. It’s a warmly funny tale, with a tail… and terrific performances from Luke and Lesley Sharp among others. We also talked about Kieren, Macbeth (he’s currently starring as Malcolm for the RSC), and the possibility of making beans on toast for Kirsten Dunst. Sarah: I enjoyed Dusty & Me and I thought you were really good – it’s a coming of age tale about being comfortable in both worlds, though quite a lot of that dilemma is in Dusty’s own head. When you read the script, what were your first thoughts on it? Luke: I really enjoyed the script – it was a role that I felt an instant connection to. There’s a lot to Dusty that I think everyone can relate to, but it’s always great when you read a script and you feel, “I get this, I understand him”. I loved the story and I’m a big fan of indie film anyway, so when it came through I was just excited to be considered. And coming of age films, I actively seek them out when I go to the cinema, there’s something about that period of time that’s really fascinating. Having lots of big decisions to make that shape your future, it’s a really interesting time in someone’s life I think. The time period made it extra-interesting. I loved that it was set in the 70s. I’d not done that period before and I love period drama – I guess it qualifies as period drama in a way. When I met Betsan [Morris Evans], the director, we instantly had a rapport. Then we went about meeting people to play Chrissie [the young woman Dusty has long adored from afar], which is when I met Genevieve [Gaunt]. We had great chemistry; I loved working with Genevieve, and it all felt very, very natural. 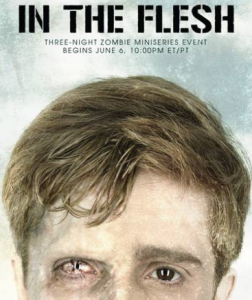 I watched the first two episodes of In The Flesh last night and really loved it. So now I’m going to be one of those annoying people who goes on about an incredible TV series they’ve just discovered, five years after everyone else. Both productions are about having two different worlds and not feeling you fit in in either of them. Is that something you’ve deliberately kept looking for in roles, or is it just that it’s an issue for young people so they’re the stories that get made? Both those jobs just came along, I didn’t really seek them out. Retrospectively, I see that link. They were very, very different projects but you’re right, there’s a similar thread to them. There’s something about In The Flesh that was quite fatalistic. I try to be fatalistic as an actor, you know, that the jobs that come to me are the right ones. And the joy of it is when everything adds up and makes sense and you think “I’m doing this part because I’ve experienced this or that” and you can bring something real to it. I think people do have a fascination with outsiders, of feeling like an outsider, and to me they were two male roles where you don’t have to play some kind of hero… these male roles that are vulnerable. That to me was the attraction in playing misfits, as it were. But ultimately they are real characters – everyone at that age feels awkward, and doesn’t necessarily know what they want and who they are. I guess that’s what I’ve been drawn to. But In The Flesh was quite dark and Dusty & Me felt very light. It’s a comedy and Betsan’s vision was that she wanted it to be punchy, and bright colours. She didn’t want it to be a painting of the North that was grim, she wanted it to be alive and colourful. So it felt quite a different job to In The Flesh, because it was lighthearted. In The Flesh was quite intense. It was one of the best scripts I’ve ever read – it was everything to me really, it was a one-off. Something I liked about Dusty & Me was the design. 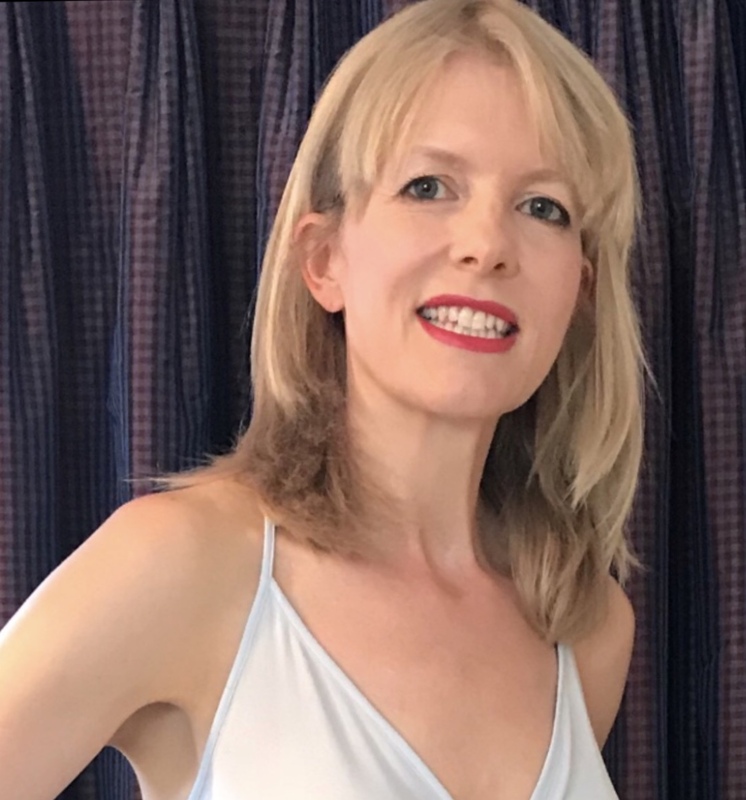 It’s very clearly set in the 1970s, but it’s quite realistic in that the older characters are sometimes wearing clothes from the 60s – in real life you don’t throw out all your old clothes when the 1970s turn up, and suddenly start looking like someone from Abba. Did you do any research on the 70s, and did they let you keep any of the clothes after? Georgie [Dusty’s cool footballer brother] had a great wardrobe! You know, I did research the 70s. I tried to watch films from that time, and also because it was my dad’s time he got out pictures from when he was Dusty’s age and we look exactly the same. My dad and my uncle both look like Dusty, with long hair and flares. I didn’t keep any of the costumes as they were all hired. I loved the costumes. Like you say, people in their own eras – that’s a tiny detail that makes the difference. The cool box! We had the same cool box in the 80s. Which just shows that real families keep things and they get used for decades. As soon as I spotted it in Lil’s kitchen I was like “”Yes! That’s our cool box”. Ben Smith the designer made this incredible set. It was like being in the 70s. It was as if you were in the house, so there wasn’t much imagination needed as it was so brilliantly designed. You said that you looked like your dad in the photos, if you’d been a teenager in the 1970s would you have been a Derek, a Georgie or a Little Eddie [Dusty’s wide boy older brother]? [Laughs] I think I’d have to be a Derek. Yeah let’s face it, I’d be Derek. The costumes make you walk differently as well, the shoes and everything – it felt so strange wearing heels with flares but it was also quite freeing! I grew my hair for the part, I had my costumes, so I felt very much in character which always helps. We don’t see very much of his schooldays. I loved Little Eddie trying to tip the headmaster when he picks Dusty up. Did you fill in any backstory yourself about whether he enjoyed his posh school? I imagine that he felt more at home at that school, but also felt equally an outsider there because of being the scholarship boy. My mum was a scholarship girl at her school, and she told me about feeling a bit of an outsider there because she couldn’t go on the really fancy school trips and things like that. So I drew a bit of that from my mum actually, in terms of thinking about what it would been like at school, and obviously he’s into classical music and reading. I think he would do well at school though ultimately wouldn’t feel like one of the gang. But more so than at home I think. To a degree I’ve been trying to work this out. I was at a state school and everyone thought that I was – inverted commas – posh, so at my school I was occasionally made to feel like I was, you know, not one of the gang. So I related to it in that way except that Dusty is at a very nice school. So though it was the opposite, it was something that I could draw upon. I guess I do! When I did Quartet [directed by Hoffman and starring Smith] I was quite starstruck by everyone and everything, and it was my first job out of drama school. It was all a bit overwhelming, but everyone’s just normal so you try and behave normally around them. People feel uncomfortable if you’re uncomfortable around them, I think. Lesley was amazing, I love her work and I was so thrilled when I found out she would be playing my mum. She was fantastic on set and we had a great rapport. I loved doing all the scenes with her. She’s really understated isn’t she, but she just appears and I was going to say she sprinkles stardust, but it’s not really as she’s not starry. What I mean is, it’s that huge experience and I can imagine how you felt when she was there. Yeah it was like “oh Lesley’s going to be on set today”, it was really exciting. She was absolutely great and so supportive as well. 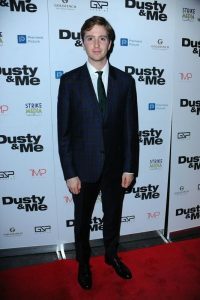 [Dusty] was a big part, it was very long days and I would be in most scenes. I had to keep my energy up and she was really supportive of that – she was brilliant. How do you as an individual cope with the ups and downs of being an actor? It must be hard to stop your self-worth being tied to your latest review, or if you get a particular job. I think it’s something that I’ve got more comfortable with. Someone told me a quote about “being comfortable being uncomfortable” and I think that was the best little nugget of advice I got – to embrace being uncomfortable, not knowing where you’re next job is, and that you know one minute you’re a hit and the next minute you’re not. I was really, really super-lucky when I left drama school. I was working for a long time during the first few years. 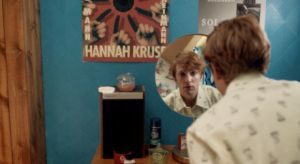 The TV series came out and we had no idea what it was going to be like or how people were going to respond to it, but people across the world had such an emotional response to In The Flesh and felt the part [of Kieren] really spoke to them. I’m still processing that really. It was the first time I’d had the experience of being recognised in the street or something. I got used to that eventually, though it’s weirder now when, very rarely, someone comes up to me and says they really enjoyed it. I’m not expecting it any more because it’s not on TV. It’s important to have great friends and family, people that understand. I’ve made some really great pals in the industry and we all know what it’s like. We’ll go for coffee and talk about that terrible meeting we had, or a terrible casting, and so you build up your own little support network within your industry. And then I’ve got friends who are not actors. It’s nice to have a wide perspective on it. The industry is the industry, and it doesn’t make sense all the time. Once you accept that, well I don’t know if it gets easier, but you adapt. And try not to take everything personally, which is the hardest thing to do. Rejection is really difficult. I’m lucky as I was familiar with the industry from quite a young age, maybe that helped a bit. Do you have any desire to get behind the camera directing or screenwriting, or are you happy as an actor? I’ve been thinking about this as a lot. I’ve got lots of friends who are writing things, and I absolutely love film. The last time I considered doing anything other than acting was when I did a practical filmmaking course for an A’Level and I thought maybe that would lead to being a DOP [Director of Photography]. I just was fascinated by film, and wanted to make films. Maybe one day I would like to direct a film, even a short film but I am actually genuinely happy being an actor really. I’ve seen so many directors work, and there’s so much more to it than even I thought originally. It’s not just directing actors, it’s a technical job as well. So I’m a bit in awe of them. I’m totally in awe of Greta Gerwig. I’ve watched her in films for such a long time and she’s got such a particular quality that she brings to the work she does. Lady Bird was one of my favourite films of last year. The way she’s taken her essence, her personality and brought it into her direction – you can tell it’s Greta Gerwig even though she’s not in it. It’s like an innate voice, isn’t it? When you’ve got something that strong, that is incredible. And how people direct when they’re also in the film – I don’t know how people do that. But yes it would be cool to do something eventually. Are there any genres you’ve not acted in that you really want to do, or something where you dipped your toe in and thought “actually I’d like to go back to that on-screen world at some point”? I did a film about the Bronte sisters with Sally Wainwright [To Walk Invisible: The Bronte Sisters], and that was my first time doing proper period drama with bonnets and top hats and stuff. That was fun. I’d love to do more period drama. Yes it is! I don’t really have dream roles really – I love new writing, I love going to see new plays, and I think I’m drawn to the screen a lot because it’s often new writing. That surprise of reading a character for the first time. Bringing something new to a role that people are very familiar with… I think it would be fun to work with a director on a part that’s very familiar but saying “I think it should be played this way.” I’m working with director Polly Findlay at the moment in Macbeth and her vision for Malcolm was really interesting. So this is a stage version of Macbeth being shown in cinemas? It’s on stage – it was at the RSC and was shown in cinemas for RSC Live, and we’re now transferring to The Barbican. This production has been designed by Fly Davis and it’s quite filmic, so it was quite fun for the live team to film it. [RSC Live] was really cool – a wider audience could see it, and it had worldwide screenings I think. The Barbican is one of my favourite buildings; it’s a pretty cool place to do a play. This is my first time doing Shakespeare – I had a hankering to do some classical theatre. Shakespeare is the ultimate in trying to bring something new to a role isn’t it? Yeah, Macbeth is so famous everybody has their own idea of what it should be or how they imagine it! It’s a striking design and concept that Polly’s got, which I think really works well. She wanted to make Malcolm very young and ineffectual and she’s given me a real journey to go on. I’m just making links [laughs] with the film and the TV show that we’ve talked about already, going on this journey – you know, the king’s son who’s very much not ready to take the throne, being propelled into a scenario where he has to suddenly rule the country and reclaim Scotland. But she’s really found something interesting in Malcolm. I think a lot of productions just [see him as] a character without much scope, but Polly’s given me a real story arc in this production. If you could work with any co-star, living or dead, but to get them to agree you’d have to impress them with a different talent – who would it be and what would you do? Would you write them a poem? Bake them a cake? A bit, I don’t think she’d work with me if I did sing though. NO ONE would work with me if I sang. I say Kirsten Dunst because I really enjoy watching her on screen, and, you know, she’s Kirsten Dunst. 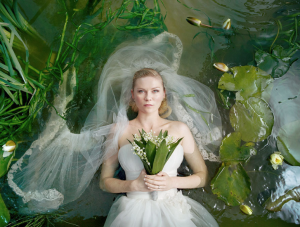 And also for [Lars Von Trier’s] Melancholia. Her performance in that is one of my favourite performances ever. I think it’s extraordinary. But what could… beans on toast? I think I could do a mean beans on toast! She’s probably the type of woman who would really go for that! Do you think she’d be in to that? [laughs] Maybe she’d think that would be endearing, she’d be like ‘awww bless him he can’t really cook”. Or drawing, art? I’m okay at that. I’d probably do Kirsten a sketch! 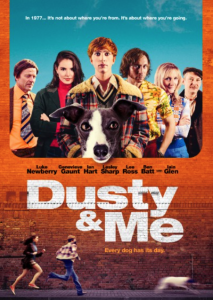 Dusty & Me is in UK cinemas from 28 September and is available on VOD from 1 October 2018. 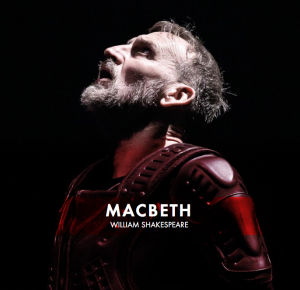 Luke is appearing as Malcolm in the RSC’s Macbeth at the Barbican Theatre in London, with Christopher Eccleston and Niamh Cusack. Check out my review of Dusty & Me here, and watch the trailer below.